Confession: It takes nothing short of a miracle to get me to work early. And by miracle, I mean being told that “there will be donuts in the office between 9-10.” I got there at 10:05 to find the office locked (which is how we know that this was the coffee hour hosted by the German department… the French understand being fashionably late and the Spanish don’t believe in time) but after some scrounging around the main office, I found the leftover donuts and taught about fifteen minutes later fueled by an awesome sugar high. And then I would dissolve in laughter at my own wittiness and shove my face with donuts. This scenario repeated itself every week. For three years. And it just got better every time. I have been ready for the cupcake crazy to end for awhile now, and while I would really love for specialty scone shops to pop up everywhere, I am also totally fine with donut shops taking over. This past weekend I did a really fun engagement shoot that ended with the couple introducing me to the glory that is Zeke’s DC Donutz in Dupont Cirle. What it is: Tiny donut shop that offers only a handful of different flavors of donuts but I’m pretty sure they are all perfect. They also sell cereal milk, which is obviously the only way to eat milk. 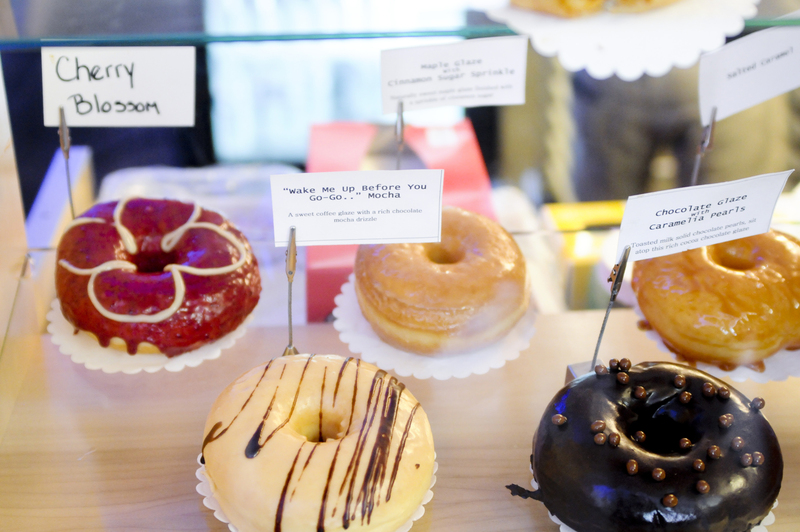 Why you should be excited: Because those donuts taste like heaven. They are giant, hot, fresh, gooey, perfectly sweet and fluffy orbs of Awesome and you need one now. I had a salted caramel one, which meant that my fingers got stuck to eat while eating so I was “forced” to eat it in under ten bites. Anyone know of any other DC donut places? I heard about the Astrodonuts opening soon and I am pumped to try it, as it specializes in donuts and FRIED CHICKEN, a logical food pairing obviously. This entry was posted in Uncategorized and tagged DC, donuts, food, photography, weekend fun, why i love dc. Bookmark the permalink. I know this is shameless, but i want the world to know that I told you about Astrodonuts!! Dear World: BROOKE IS THE SOURCE OF DONUT KNOWLEDGE. I would totally watch The Last of the Donuts. That movie sounds amazing. And now I’ve got a serious donut craving. It will be kind of like a documentary about my love for donuts, starring me. And the donuts. Because they are stars. Thank you DC for crazy prices! Although, I should also say that they were HUGE — like eight inches across and a could inches high. I have tried to go here twice, and each time, they have been closed a few minutes before their closing time of 7pm! They are missing out on the late night crowd- but I’m glad they were delicious! I will make it happen soon. I totally think that they need to change their hours. We originally went at 9 on Saturday and it was closed so we had to go back. I can’t help but think, why would you be closed Saturday morning… THAT IS PRIME DONUT TIME!!!!!!!!!! I am not a food critic. I am, as you know, a food skeptic. And I am wary of the savory donut. Do I even want to know? So I didn’t try any of the savory ones, but I feel like a savory donut is in fact just a bagel… right??? It’s a thing that a restaurant in NY started, but basically it means milk that tastes like it does after you eat a bowl of cereal… sugary and delicious!